There are just four days left until we ring in 2013 and I think that these cookies should be the last recipe you enjoy this year. The ingredients are easy to find, the recipe is simple, and the results are sinfully delicious. I brought a batch along with us to a Christmas party earlier this week and no one could guess that they were the healthy cookies that the nutrition educator brought along with her. 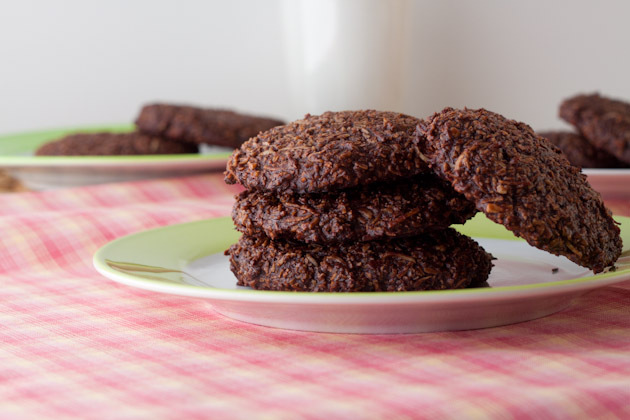 These cookies are very similar to my 5 Ingredient Chewy Chocolate Coconut Cookies (picture below), but can be made without coconut and are naturally caffeine-free thanks to using carob instead of cocoa powder. 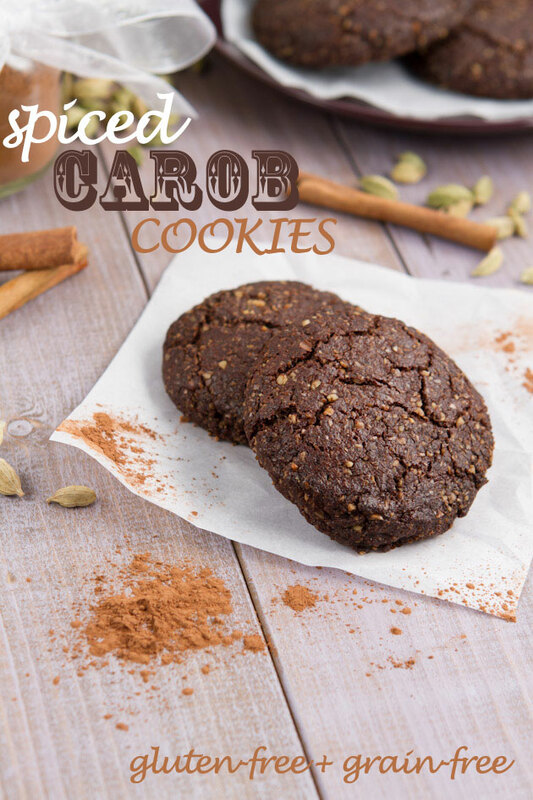 If you’re not familiar with carob, I highly recommend you give it a try. It’s nutty, full of flavor, and combines really well with an array of different spices. 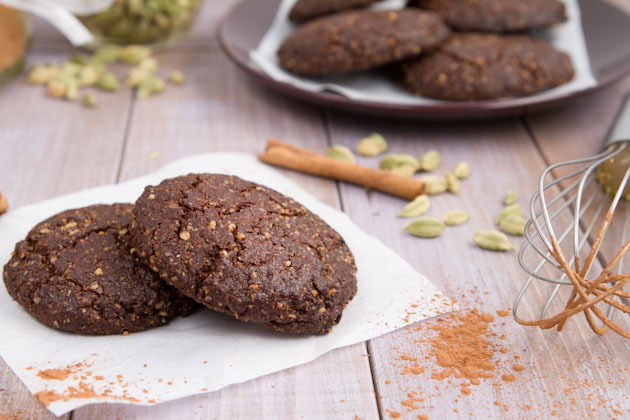 And if you don’t care about caffeine, the health benefits of carob, or that these cookies are grain-free or vegan, just know that they’re good. They’re so good that you may want to just double up on the recipe now to save yourself from remaking them again in 30 minutes. They’re so good that you may throw your spouse in the dog house if he dares to eat the last one. They’re so good that if you accidentally drop one on the floor, a 20 second rule totally, totally counts. They’re so good that you couldn’t help but steal one out of the Christmas cookie tin you had prepared for your spouse’s, boss’s, daughter. Ya… I’m going to have to make another batch. Scoop cookie dough into a ¼ cup measuring cup, turn over and flop onto the preparing baking sheet leaving around 2-inches between each cookie. If you're allergic to nuts you can try to substitute the ground walnuts with ground sunflower seeds instead. Begin with a bowlful of dry ingredients, whisk to combine and set aside. Do the same with the wet ingredients. 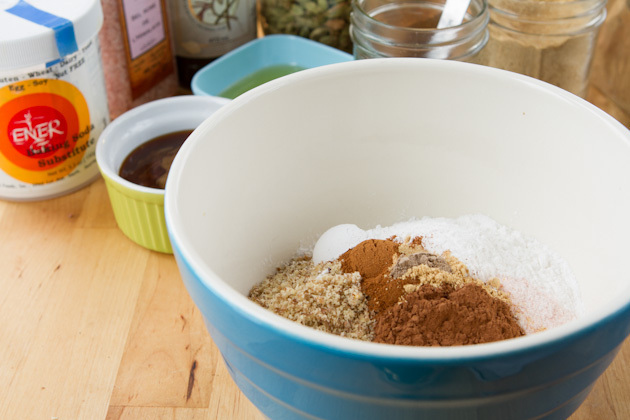 Pour the wet ingredients into the bowl of dry ingredients and stir to combine. The mixture will get pretty tough to mix, this is normal. Just keep kneading until everything is incorporated. Scoop 1/4 cup sections and place on the prepared baking sheet. You’ll have 6 cookies in total. Press down with the palm of your hand. Bake in the prepared oven for 13-16 minutes and remove when the tops begin to crack slightly. Allow to cool completely and dig in! 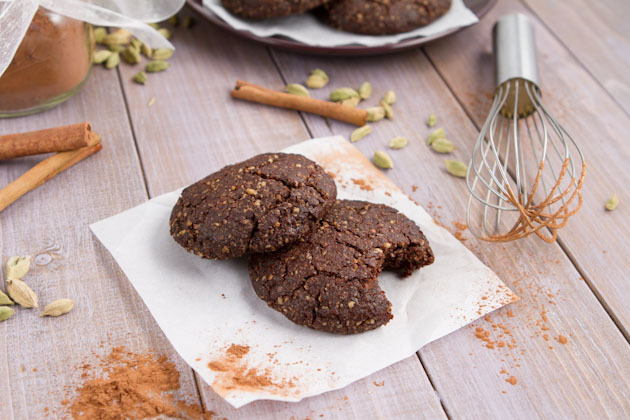 These just may be my new favorite grain-free cookies. I’m all up in carob’s business lately, I can’t seem to get enough of the stuff. I’m planning on making another batch of cookies today so that I can take them along with me on my flight to Kitchener this afternoon. That is if I don’t leave my packing until the very last minute and end up shuffling around the house in a panic trying to get my life together before I leave. Cookies in hand or not, I’m so stoked to be going out to spend the weekend with Angela again! I’m sure I’ll be back next week with loads of new plant-based meals to share with you all. 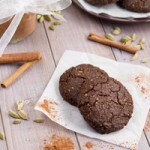 Have a fantastic weekend and don’t forget to make these cookies! Think of it as a late Christmas present to yourself. Yes. Do that.